Bluetooth speakers make for easy gifts, but there are so many of them out there now that it’s actually difficult to choose one that’s right for the person. Quality varies wildly, as does feature set. However, it’s relatively easy to determine whether the Altec Lansing LifeJacket series of speakers are the right choice for someone. These speakers cost a little more than equivalent quality speakers, in terms of the sound that they produce, but they’re also designed to be tough as nails and withstand almost any punishment. 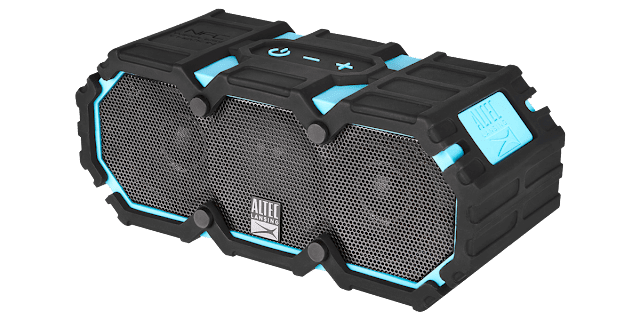 For the “GoPro” generation, this makes them a companion that will survive the kind of activities that they’re going to get up to, which makes them the perfect companion speakers. 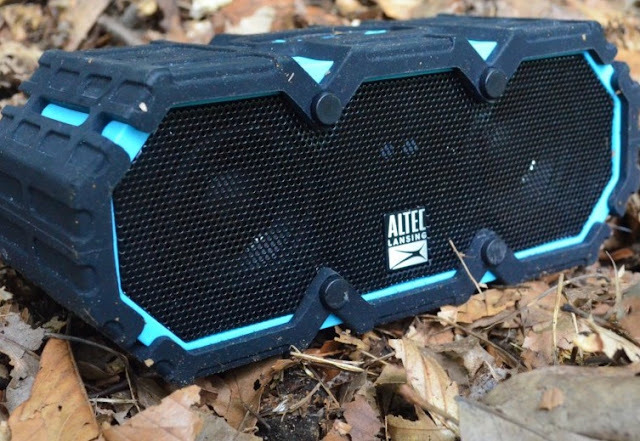 Even if you’re going out to do extreme sports, these speakers are a more useful outdoors companion than most. You can take the speaker camping, for example, comfortable in the knowledge that the dirty conditions won’t affect it, nor will some rain destroy it. It’s a good companion for relaxing at the beach, because sand doesn’t bother it. It’s a good speaker to stick on the mower or drag into the greenhouse as you’re gardening, because heat and humidity don’t bother it. Heck, for those of us who love belting out a tune while in the shower, finally we have a portable speaker that can cope with that. This ruggedness comes at the expense of the aesthetics a little, perhaps. There are no sleek curves on the Life Jacket products, and the thick rubber coating around the edges gives them a tough, weathered look. With that being said, I suspect the target market for these speakers will find them attractive enough, and in keeping with the other bits of equipment they carry around. It looks more at home in a bag filled with camping gear than a bag filled with Apple products, let’s put it that way. 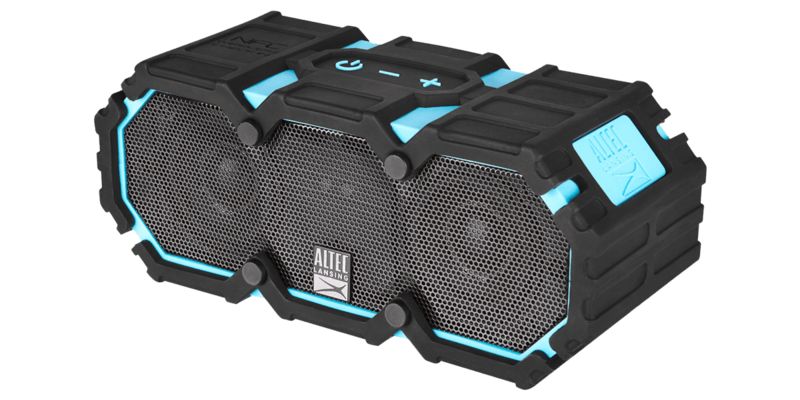 And it’s worth noting that there’s a serious issue with the speakers, in the way that they’re promoted as devices for extreme activities; as Bluetooth speakers, they require a paired Bluetooth device to actually play music. 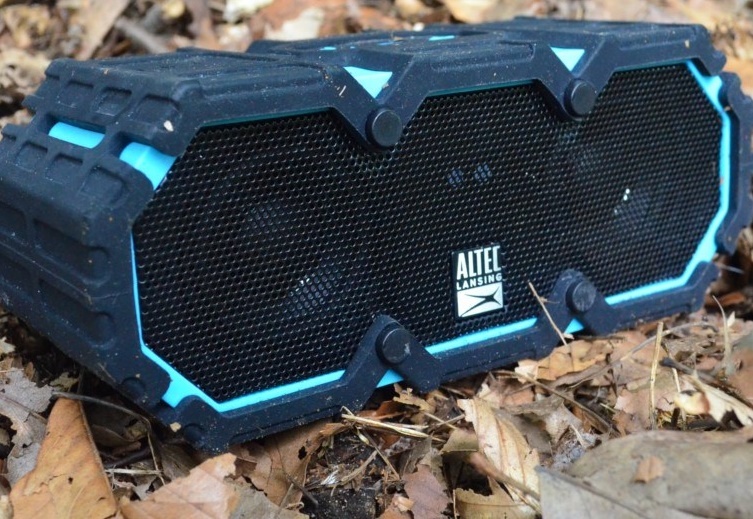 Most phones and tablets aren’t anywhere near as rugged as this device, so while you might be able to take the speaker surfing and not worry about it, you’re still not going to get any music when your iPhone takes a dunk and dies. For camping or lazing on the back of a boat it’s less of an issue, of course. The speaker itself is fairly no frills beyond the ruggedness; each model offers a long life battery, and you can recharge your phone or tablet from most of them. With select models it’s possible to pair them up for deeper and richer sound. The range within which it will pick up a signal is pretty decent, too. Perhaps the best feature of all though is that the speaker immediately tries to pair up to devices on being switched on; with some other speakers you need to press a button to start the pairing process, and that's a clunky process. Here it’s seamless. 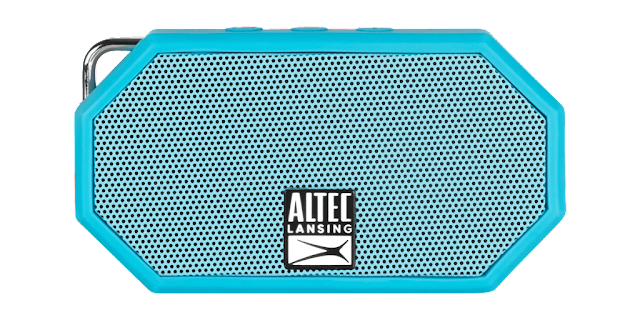 I could do without the obnoxious voice saying “Welcome to Altec Lansing” every time I switch the thing on though. Speaking of minor niggles, it would be nice if the speaker’s remaining power was reflected on the phone once paired (as some other speakers do). There’s no real way to know when you’re about to run out of battery with this one. As for the most important piece of the puzzle, the sound itself, I was pleasantly surprised with what the Life Jackets offered. I was expecting that they would heavily preference bass, given that the speakers are primarily intended for outdoor use and bass travels better in that kind of ambience, but instead the sound that is produced is nicely balanced and works across all music, not just the kinds of songs that you need to feel, rather than hear, to appreciate. For bassier tracks there was a clarity to the music that I appreciated, too. Too often with bassy speakers the sound gets distorted and messy, but that’s not a problem this speaker has. Applying the Miku test, where I pair the speaker up to my iPhone and play Miku Flick to test whether the speakers improve the experience, I found this to actually be one of the better speakers that I’ve tested. Miku music is rarely bass heavy, and I was able to hear the lyrics with a clarity that helped me understand the Japanese lyrics, in my imperfect understanding of the language. Because the rhythm game ties it to the lyrics, in this case, I found that I was actually doing better than through the iPhone’s speakers or cheaper headsets. I reckon it’s worth investing the extra money to get a rugged Bluetooth speaker. The peace of mind for being able to use it as a truly portable device, even if you won’t be taking it extreme sporting because the phone that it’s paired to is not rugged, makes it more useful and versatile. You’ll be using the Life Jackets at home, at parties, while working and everything in-between.